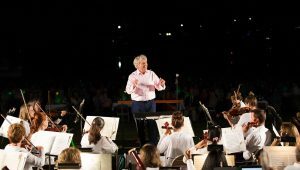 The Montgomery Symphony presents the 33rd annual Broadway Under The Stars Pops Concert. Join us for a night filled with music from your Broadway favorites including Fiddler on the Roof, The King and I, and The Sound of Music. Coolers, baskets, blankets, and lawn chairs are welcome at this free concert of Broadway show tunes performed lakeside at the Alabama Shakespeare Festival. Gates open at 5:00 p.m for picnicking. Interested in great parking and great seating? Let us pack your picnic! $40 reserves your parking, table & chair, catered dinner, and a drink ticket! This fundraiser picnic is open to all and supports the scholarship programs of the Montgomery Symphony League. For more information, contact the symphony at 334-240-4004. Broadway Under the Stars is generously sponsored by Regions Bank.